Hotel mic si primitor, inconjurat de plantatii de maslini. Ofera camere confortabile cu vedere spre mare sau spre munte, piscina, internet, atmosfera calda, familiara. Potrivit pentru o vacanta linistita si economica. Located in Skala Potamias and partly build in 2003 and 2004 the “Blue Sky” Rooms are surrounded by olive trees lending a very Greek atmosphere to your holiday. The Rooms are comfortable, spacious and provide a bedroom, bathroom, with TV, air conditioning and balcony or yard. The hotel’s aim is to make you feel at home, with memories of an unforgettable holiday. Distance from the Beach: ca 150mDistance from the Port: ca 30kmDistance from the nearest village/town: ca 14km (Limenas)Additional information: Cleaning: dailyLinen Change: every 3 daysTowel Change: every 3 daysBeach description: public, sandy, sandy with pebbles, beach bar, sunbeds and umbrellasBus stop: ca 50mATM: ca 50m The images shown here serve to give a general impression of the hotel. The facilities may be slightly different from these examples as well as the names of the room types. This property enjoys a central location in Skala Sotiros. The property lies just 20 metres away from the stunning beach. The port of Prinos is situated just 5 km away. 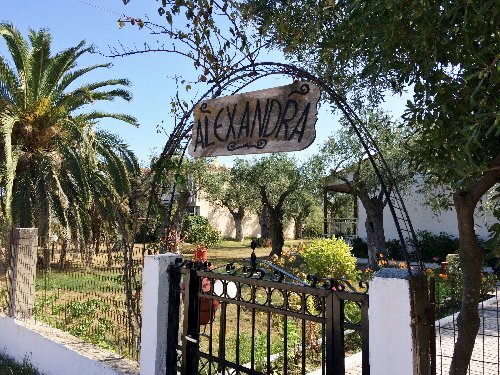 This property enjoys close proximity to Limenas, where guests can experience and explore the culture and history of the area. This charming complex comprises tastefully-designed, well-equipped studios, which boast stunning views over the Aegean Sea. The property provides a 24-hour front desk, where guests are delivered exemplary service and advice on where to go in the area. This property is a great choice for business and leisure travellers alike. Hotel mic, compus dintr-o cladire cu trei etaje. Zona confortabila cu gradina amenajata. Camere spatioase cu bucatarie, acces gratuit la internet.Aflat la o mica distanta de plaja si in apropiere de centrul statiunii Limenaria ce dispune de o infrastructura turistica dezvoltata.Hotelul este potrivit pentru o vacanta linistita, economica. Un mic hotel economic aproape de port, stil simplist, acces la internet, restaurant. Un mic hotel tradițional, o zonă confortabilă cu grădină, o selecție de camere confortabile, acces la internet, servicii de calitate. Un mic hotel economic aproape de mare, stil simplist, bar, internet. Hotel economic, situat in apropiere de plaja, stil simplist, cu gradina, acces la internet. Anassa studios, located in the famous for its beauty area of Skala Potamia, on the eastern part of the island constitutes a perfect choice for both couples and families, since it provides the guests with facilities such as the barbeque and completely new common kitchen. The playground and the outdoor furniture are perfect relaxation. Small parking available at the hotel. The standard rooms are equipped with AC, Sat TV, Fridge, Hair dryer, Kettle & Toaster.The Studios have also kitchenette.Clients staying in STD rooms can use fully equipped common kitchen - payable on the spot.Distance to the Beach: ca 700mDistance to the Port: ca 13kmDistance from the nearest village/town: ca 700mAdditional information: Cleaning: dailyLinen Change: after 2 daysTowel Change: dailyBeach description: public, sandyBus stop: within 150mATM: within 150m The images shown here serve to give a general impression of the hotel. The facilities may be slightly different from these examples as well as the names of the room types. Blue Sea Beach Hotel is located just 5m from the sandy Chrissi Ammoudia Beach. 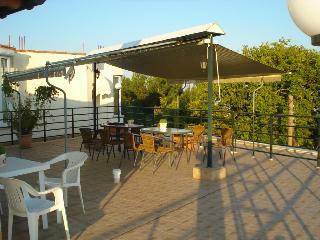 It offers rooms with balconies overlooking the Thracian Sea and Mountain Ipsario. The rooms are equipped with TV and fridge and all are air conditioned and have classic furnishings. Free WI-Fi is offered throughout Blue Sea Hotel. Breakfast is served daily at the beachfront tavern. Greek and international dishes are also served at the beachfront tavern. Chrissi Ammoudia Beach stretches over 3 km of coastline and is well-organized. Guests can use the private beach with sun beds and umbrellas of the hotel. Free private parking is possible 30m from the hotel.Distance from the Beach: ca 5mDistance from the Port: ca 300mDistance from the nearest village/town: ca 15kmAdditional information: Cleaning: dailyLinen Change: 2-3 daysTowel Change: 2-3 daysBeach description: private, sandy, sunbeds and umbrellas Bus stop: within 200mATM: within 500m The images shown here serve to give a general impression of the hotel. The facilities may be slightly different from these examples as well as the names of the room types. In the ancient harbour of Limenas, right on the sandy beach, Captain's Apartments offers self-catered accommodation with private balconies overlooking the Aegean Sea. Guests can enjoy drinks, seafood and local dishes at Captain’s Bar and Restaurant on the ground floor, while admiring the sea view. Scenic Limenas has many waterfront bars and tavernas. 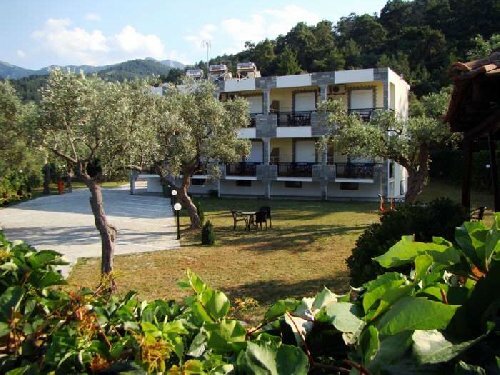 The center of Thasos town is 200 meters away. There is a bus stop just a 5-minute walk from Apartments Captain’s. Free public parking is possible at a location nearby. Distance from the Beach: ca 200mDistance from the Port: 200m from LimenariaDistance from the nearest village/town: ca 200mAdditional information: Cleaning: dailyLinen Change: every 3 daysTowel Change: every 3 daysBeach description: sandy beach Bus stop: bus office is ca 1km awayATM: ca 400m The images shown here serve to give a general impression of the hotel. The facilities may be slightly different from these examples as well as the names of the room types. 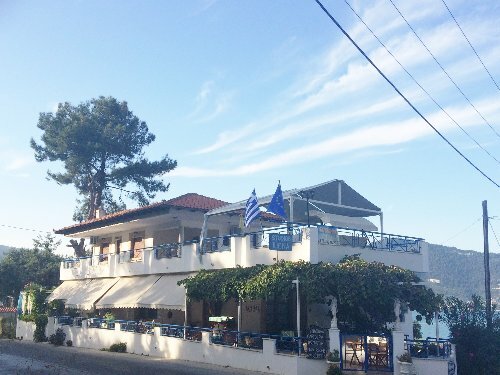 Situated right next to the beach of Skala Potamias, Blue Sea Beach Resort has a bar and restaurant with tables right by the sea. It offers elegantly furnished rooms and studios with free Wi-Fi and private balconies. Rooms and studios at Blue Sea Beach feature stylish wallpapers and wooden furnishings. They come with a mini fridge, TV and air conditioning, and the studios also include a kitchenette. Guests can taste Greek and international dishes at the on-site restaurant while enjoying the unlimited sea views. Breakfast is served daily at the hotel’s beachfront restaurant. The port of Limenas is approximately 12 km away. Free private, on-site parking is available.Distance from the Beach: ca 10mDistance from the Port: ca 12kmDistance from the nearest village/town: ca 12km from Thassos townAdditional information: Cleaning: dailyLinen Change: every 2-3 daysTowel Change: every 2-3 daysBeach description: private beach, 10m from the hotel with free sunbeds/umbrellas, shallow waters, sandyBus stop: ca 200mATM: ca 500m The images shown here serve to give a general impression of the hotel. The facilities may be slightly different from these examples as well as the names of the room types.